If your only reference to mushroom soup comes out of a can you are in for an unexpected delightful indulgence. This mushroom soup is tremendous. Years ago, Graham Kerr presented this mushroom soup and it was so special that I’ve made it many times through the years and have never grown tired of it. There is nothing wrong with Cream of Mushroom soup I suppose, but this particular Mushroom soup deserves a prominent place at you table. Make it once and you’ll make it yours. This is one lovely mushroom soup I hope you try it soon. I'm going to try this today. It looks great! Soup looks yummy. My kids love mushrooms. I am planning to make your cream of carrot soup this week. I am going to add this one to the next grocery list. Thanks for you kind comment on Zane's blog today. I've been craving mushroom soup! I'll have to give this one a try. Oh this recipe is lovely! A good mushroom soup is second only to a really good french onion. Oh so yummy! Mushroom soup, yum! Thanks for sharing this recipe. This sounds fabulous. I've never had tomato paste in mushroom soup, but I'm willing to give it a try. I don't suppose it matters what kind of mushroom? I used to be a big fan of the Galloping Gourmet. Thanks for the recipe. HORST PETERS: This is one of my personal all time favourites. VARDHINI: I bet the kids will really really love this soup. LYNN PROCTOR: I can guarantee she will love this. I see Zane in those spectacles and marvel at him. Just think, against all odds, and the coolest boy on the block. TORVIEWTORONTO: Thank You Akheela, you're very kind. JANNA: Be careful, once you try rhis mushroom soup tou will want it often. LADY DRAGONFLY: I feel that this is a great mushroom soup, and you will too. SUSANNE DRAZIC: You're welcome, enjoy some soon. SUSAN FLETT SWIDERSKI: I use regular field mushrooms but you can substitute your own preference. KATE O'MARA: I do too and making some. Thanks for calling. Like peter I want to say I would love to try this today. :) Because it makes very nice sound here. Thanks! 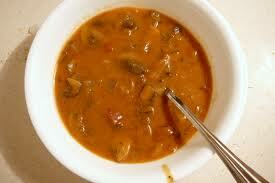 I have made mushroom soup before but never using tomato paste. I bet that gives it a very nice flavor. The Hubs uses vermouth in his snapper soup.... I don't think he has tried it in mushroom soup. Sounds really good. Thanks for posting this recipe. Mushroom is my very favourite. I remember the Galloping Gourmet - I used to love that show. I don't know why, but I always assumed mushroom soup was extra salty. Yet, reading through the recipe, it sounds quite delicious and if I used low sod chicken stock, I bet it wouldn't be too salty. Thanks! MY BEST BANKS 001: Okay, go ahead and try it today, why deny yourself this culinary delight any longer. MY JOURNEY WITH CANDIDA: This is, without a doubt, my own personal favourite mushroom soup. Dry vermouth is great in these kinds of soups. MIRIAM: You could easily substitute vegetable stock for this lovely soup. LAURIE PEEL, RP-CRA: You'll really, really love this soup. I enjoy his television cookooks. TL CONWAY: If you are sensitive to salt, use the low sodium chicken stock. You could add salt if you feel it needs it. Mushrooms are like potatoes in that they need some salt or else the flavour is dullish.